The official website of the Abu Dhabi 3×3 Basketball is presenting you the 12 teams that will take part in the FIBA 3×3 World Tour Final, October 15-16, Nation Towers. Today: Team Manila North. The game: Experience. Size. Basketball IQ. The winners of the 2013 FIBA 3×3 World Tour Final in Istanbul are looking for a second title and for sure they are among the contenders. With Blaz “The Birdman” Cresnar dominating the board and getting a lot of help from Kunc, and with Hercegovac and Cajic threating from outside, Ljubljana is a team build for the 3×3 game. They will be deadly if they catch a good shooting day, but can also be the unpleasant surprise, if they are not focusing on their game. The story: The 2013 World Tour champions had harsh times in the begining of the year, as the original team split in two. However, Blaz Cresnar, who left the team together with Alex Smaka, had a second thought and joined back Hercegovac and Kunc. Together with the new addition, Tomo Cajic, they traveled all around the world this season, playing challengers in Asia and Europe, and World Tour Masters in Manila, Beijing and Lausanne. They qualified for Abu Dhabi Final in Beijing even if they lost in the final against Doha. 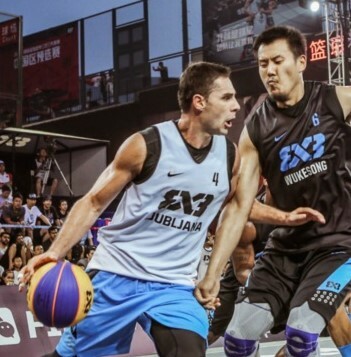 The former number one in FIBA 3×3, Cresnar is the tallest player in the tournament, while the Kunc bring the experience from two Eurobasket editions where he played for the Slovenian National Team. Cresnar, Kunc and Hercegovac were silver medalists in the first edition of the 3×3 European Championships, that took place in Bucharest, in 2014. The quote: Our team is in great shape already. We are hardly waiting to come and play in Abu Dhabi and to be part of the biggest competition this year. Honestly we are thinking only about wining, with respect to all other teams of course. We traveled a lot this year, the team was seeking the best possible chemistry and set up. We had also some little problems but now at the end we are ready! Coming back to Abu Dhabi was a priority for us. First because we want to win again FIBA 3×3 World Tour and second because we had a really nice time during the Abu Dhabi 3×3 Challenger in May », said Jasmin Hercegovac. Previous PostFIBA #3x3WT Final: Team Manila NorthNext PostLipek vs. Jordan: The ultimate slam dunk battle is in Abu Dhabi!